Lest anyone think we’re changing this site’s name to “Music Lowdown,” allow me to briefly rave about Taylor Hicks in Las Vegas. During our recent hiatus here at Cinema Lowdown, we took in shows by Prince at the Hard Rock Hotel and Casino (see review here) and Taylor Hicks, currently in the midst of a long-term residency at the Paris. While my coverage of Hicks’ April 29, 2013 show will run on The Morton Report (click here to read my full review), it was such a thoroughly great time I felt the need to mention it here too. And, after all, we write about film and TV—keep in mind, Taylor Hicks was launched into the international spotlight on a little TV show called American Idol. Long story short, Hicks won the Idol crown at the end of the enormously popular fifth season in 2006 (competition included Chris Daughtry, Elliot Yamin, and Smash star Katharine McPhee). Nothing quite like Hicks had ever hit the show before or since. The gray-haired dynamo displayed the chops of an old soul (honed during ten years on the Southeast bar circuit), winning over millions with gritty versions of tunes like “Taking It to the Streets” and “Try a Little Tenderness.” Soon after debuting at number one on the Billboard Hot 100 with his Gold-certified winner’s single, “Do I Make You Proud,” a backlash began to set in. Not as readily commercial as some other Idol winners and runners-up, a series of ups and downs followed. But Hicks never gave up. As announced during an appearance on near the end of the 2012 season, Hicks became the first-ever Idol winner to secure a residency on the Vegas Strip. He spent last summer at Bally’s (backed by scorching blues rock outfit The Jamie McLean Band) and then upgraded to Paris, where he currently performs five nights per week at Napoleon’s Lounge. Though the “Idol winner” tag gives Hicks a heckuva marketing hook, it also carries certain connotations. Many music snobs, er, fans I mean, consider it impossible to appreciate (and even enjoy) Idol as anything more than a guilty pleasure at best. Others simply abhor the show and everything it stands for. The truth is less dramatic. Idol is only as good as its contestants any given year. In 2006 they truly struck gold with Hicks. 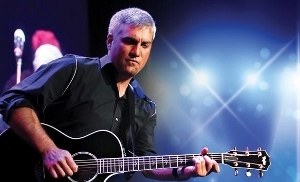 Whether you’ve ever followed Idol or avoid it like the plague, take it from me: if you love soul, classic R&B, or blues rock, be sure to catch Taylor Hicks at the Paris if you’re in Vegas. This isn’t a show aimed at American Idol fans. By no means is it only aimed at longtime Taylor Hicks fans. It’s a show for music fans. I don’t say any of this lightly, because I was once one of those snobby music fans who couldn’t believe anything truly legitimate could emerge from the commercial glitz of Idol. Hicks is one of the most dynamic live performers I’ve ever seen—and I’ve never seen him invest less than 100 percent in a performance. For more about upcoming dates and ticket information, visit the official Paris Hotel and Casino website. As a long-time Taylor Hicks fan, it really is such a relief to read honest reviews about him. He is truly one of the best live performers out there. His music is timeless. And for those of us who are so tired of the sugar-coated Pop music that permeates the radio, Taylor is a breath of fresh air and great music. thanks for the comment – totally agree, Taylor always puts on a great show! I so hope he comes to a casino near me before the year is out. The man puts on a show as good as any live music I have ever heard. I’m lucky enough to have heard some of his 2 hour concerts and his energy never faded!!!!! Once I dragged a friend of mine to Hicks’s show at the House of Blues in LA. We both walked out of there saying it was the best show we’d ever seen. I can’t emphasize it enough. If you have the chance, go see Taylor Hicks. I promise you’ll be glad you did. Many are becoming aware of the authentic Taylor Hicks. Genuiness & brilliance is what you’ll witness at all of his performances. No ‘assembly line’ reproduction with Taylor! No Gimmicks! He is the ‘real deal’. I have seen Taylor in concert several times in Vegas and also at different venues across the country…he never disappoints!! His music comes straight from his soul – he often gets lost in his music right in front of your eyes. My hope is that Vegas is a mere stepping stone to many, many more years of much-deserved success for Taylor!